Happy Friday everyone!! I am so excited — we are heading out to Vermont for this whole next week and for Thanksgiving. It’s not going to be the most traditional Thanksgiving (on the road), but I figure we’ve already had our Thanksgiving meal in several increments. Like here, here, and here. The husband was born and raised in Vermont and we’ve only been back there once. The first time was an absolute blast. We went to the schools he attended, the places their family would go, old jobs, and saw all the fun things he did growing up. We even stayed overnight in a Church campground that he helped build as a teenager. Um. Yeah my husband’s really cool and handy. I’m pretty excited to visit again and especially with the little guy – although I’m certain he won’t remember anything. BUT at least he won’t sleep through the whole trip. Yeah…did I ever tell you that time we took him to Disneyland and he slept the ENTIRE time? I guess that is what you should expect from a 2-month old though. Anyways. Road trips are my favorite. So I’m having hard time concentrating on sugar cookies when all I can think about is a long vacation car ride. It will be interesting how much I love long car trips with a one-year-old…we shall see 🙂 The husband and I have road-tripped to 44 states total and we did them all in about a month-long trip. Those are some of my favorite memories! Okay. sugar cookies…yes. Oh and peppermint nonetheless! PLUS a free printable if you want to package these cookies up and gift ’em. Fun right?! I packaged pre-made sugar cookies, but another fun idea would be to just make the dough and give baking instructions for it! So here are the kit details (pictured below the recipe): clear and fill-able ornaments (I got mine online), sprinkles (from Target in the Dollar spot), festive bags (Target in the Holiday section), copper container, fabric (Jo-anns), twine and threads (Jo-anns), frosting (homemade in a mason jar from Wal-mart or Target), spray of fake berries. And the cookies couldn’t be easier to make – they are made all in one bowl and don’t require any chilling (hooray!). The frosting is a delicious cream cheese frosting that whips together super quick. And the topping is my favorite — peppermint crunch sprinkles. Add in the flour, baking powder, salt and peppermint crunch. Mix until just combined. Shape into thick, flat discs (see picture). In a small bowl toss together the remaining 1/2 cup white sugar with the coarse sparkling sugar (or just use the white sugar). Roll the cookie balls in the sugar to coat. Bake 2 inches apart on a parchment lined cookie sheet. 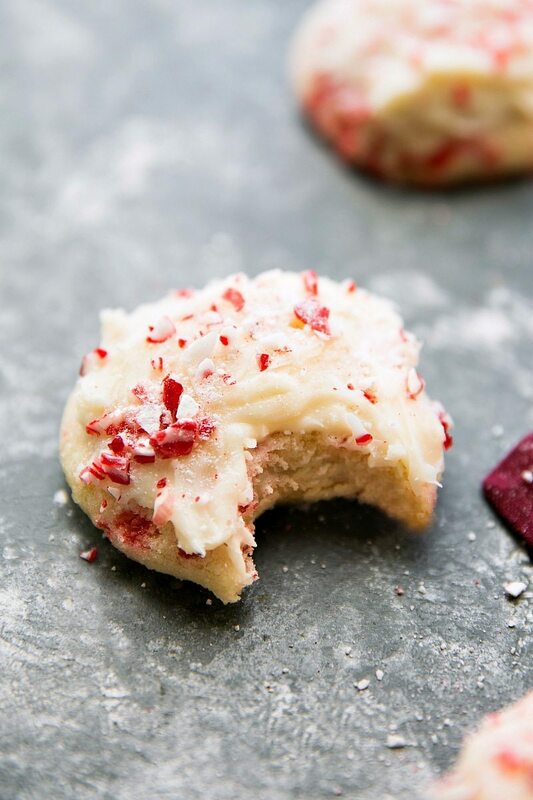 Beat together the softened butter, softened cream cheese, vanilla, and peppermint extract. Beat in the powdered sugar by slowly adding about 1/2 a cup at a time until a smooth frosting is formed. Add a little milk if needed to thin your frosting to desired consistency. Again, feel free to increase the peppermint extract amount if desired in the frosting. 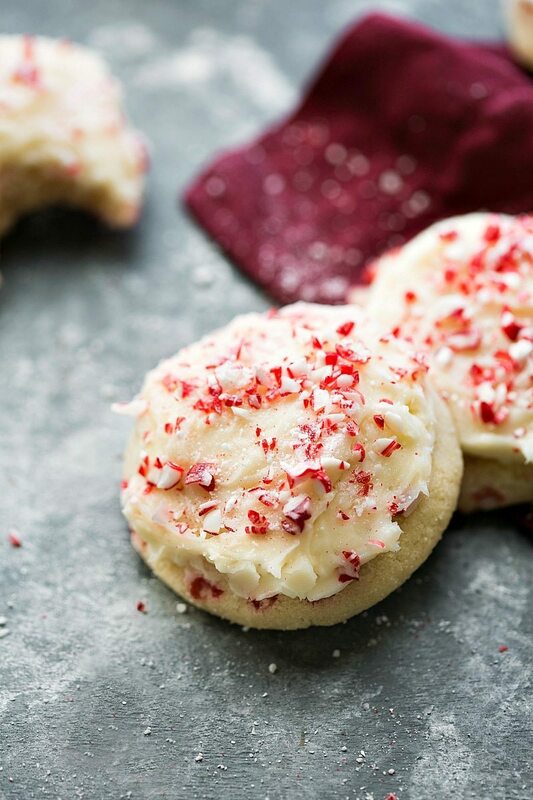 Frost the cookies and add peppermint crunch sprinkles to the top. For even softer and more flavorful cookies, chill the dough overnight (or a few hours) and bake the next day. Ahhhh what a cute printable and fun sugar cookies. Have fun in Vermont! Filling those clear plastic ornaments with something you can actually use–brilliant! I love the holly berry/leaf sprinkles. This is such a great idea for gifting! I hope you have a great time in Vermont, Chelsea! Sounds like you’ll have a blast. 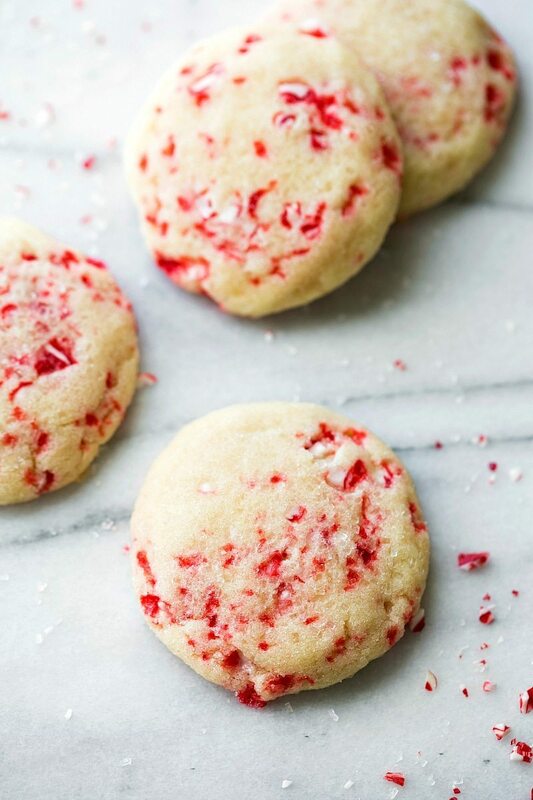 These peppermint sugar cookies look beautiful! I love the red frosting on top. And peppermint is my favorite flavor for the holidays. Pinned! Chelsea, love these cookies and the cute reindeer printables!! 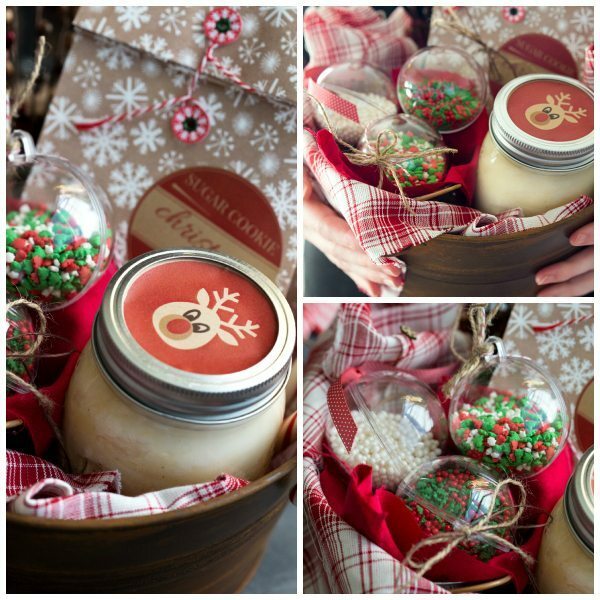 I love gifting something fun in mason jars so these are perfect! And I bet Vermont is going to be so snowy and beautiful! have a great thanksgiving!! Wow, what a great Christmas Gift! I love your idea and also your printable. It is very useful and great give to a friend! Thanks a lot for sharing this beautiful recipe and printable! These cookies are probably the cutest thing ever! Jumping on the Christmas bandwagon early never hurt either ;). I’m definitely adding this recipe to my possible list of cookies to bring to the mother-daughter exchange my friend hosts every year. They would be perfect! 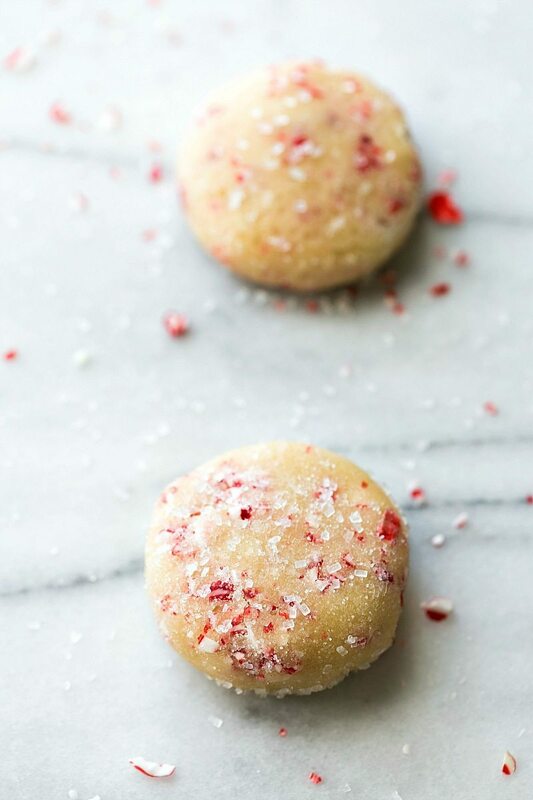 These cookies will be perfect for a gift around Christmas! I love how you do not need to chill them! They look beautiful, the kit printables are a great idea! You are so much more patient than me. I am horrible on road trips! I get so antsy! My husband and I went to college 6 hours away from our hometown so when we went home to visit for a weekend it was 12 hours in the car before it was all said and done…it was basically torture! haha! This is awesome, Chelsea! I’ve made it a goal for all gifts to be homemade this year and because my art skills are as talented as a chicken, I’m going to resort to baked goods! What an unbelievably cute idea, I love it! Have a wonderful trip!! These are adorable. I love pink and red for christmas 🙂 Have a great Thanksgiving! These cookies are so cute Chelsea! Perfect Christmas gift! These are so cute! I love love love homemade gifts like this – I always give something homemade to most of my extended family! 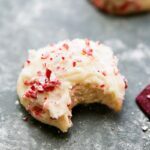 Not only do these cookies look and sound delicious, that sugar cookie kit is adorable!! What a great idea for holiday baking and traveling. 🙂 Pinned! Is it possible to write out WEEEEEEE in a more eloquent way than that? I don’t think so. But seriously – I am pinning this immediately because this is such an awesome holiday gift idea, Chelsea! I love food gifts, especially for co-workers, and the printable is super cute! 😀 Have a Happy Thanksgiving! 44 states in a month?? Oh my gosh Chelsea, you guys are the most awesome couple I know! I’d love to do that someday. But in the meantime… I’m living vicariously through you. 🙂 Have a wonderful Thanksgiving in Vermont! The dough seems a little dry is that normal? Loved these cookies!! They came out so well!! Def will bake again. Please explain the measurement for powdered sugar. Is this 5 cups powdered sugar or just 2 1/2 cups? AWESOME trecioe, Chelsea, can’t wait to bake some of these! BUT…annot figure out where to click to download the printables! Since it uses a cream cheese frosting, do these need to be refrigerated?